We are a unique store. Our owner Bernie Shine is a treasure hunter, of sorts. But he does not seek sunken ships, buried treasures, or archeological ruins. Rather he pursues genuine vintage memorabilia in quantity from dusty warehouses, defunct factories, and closed stores. He searches the world over for old stock from bygone eras in unused condition. Bernie is a long-time aficionado of antiques and memorabilia. But unlike the typical collector or dealer, he is less interested in individual artifacts than he is in mass quantities of new old stock. He seeks out pallets full of unused merchandise from the early to mid 20th century. “I became fascinated by the visual and emotional impact of seeing vast quantities of vintage objects,” he explains. 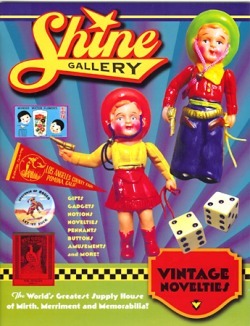 At Shine Gallery you will find bone fide period objects primarily from the 1910s through the 1960s, all authentic and vintage…and all unused and in quantity! Our store inventory includes an astonishing cornucopia of old stock items, including vintage toys, novelties, souvenirs, radios, lighters, advertising, pin-back buttons, political and sports memorabilia, patches, pennants, postcards, posters, and much more! To quote from Gilbert and Sullivan Sorcerer's Apprentice, “If anything anyone lacks, he’ll find it already in stacks.” Be prepared to be amazed in our one-of-a-kind trip in time!